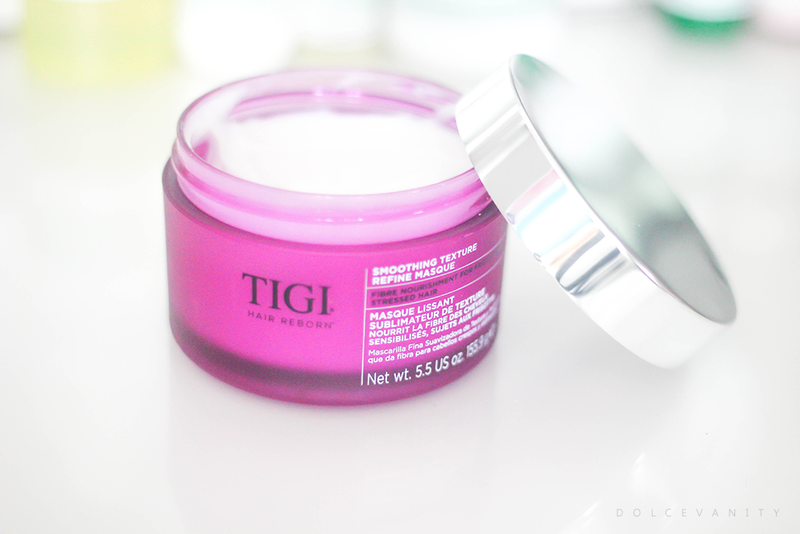 One masque I've been trialling is this one by TIGI. I've never used anything from the brand before, I see it a lot in TKMAXX but I've never truly bother so when I was sent the Smoothing Texture Refine Masque* I was a little unsure due to the fact my hairs just over coming a lot of trauma, would something new help or destroy? TIGI says : This formula with hyper-distillation technology and seriseal silk protein, acts as a silk mesh on hair fibres, binding down the cuticle for exceptional manageability. Hair reborn velvety smooth with luminous shine. For fibre nourishment and cuticle sealing. Designed to be colour safe. Frizz-Prone / Stressed Hair. Use as an intensive mask once a week. After shampooing, massage into hair concentrating on ends. Leave in for 5-10 minutes prior to rinsing thoroughly. The heat from your shower will allow mask to penetrate through your hair fibres. This tub contains Hydrolyzed Keratin, I've mentioned previously about my hairs bad experience of a keratin treatment but keratin can be good, are hair is 80% keratin but too much for my hair, isn't wise. Hydrolyzed Keratin, rinses out the hair pretty quickly so it's temporary fix not permanent and I'm fine with that. There's only so much you can do to make something dead look healthy if already damaged. It's broken down molecules making it smaller and allowing it to penetrate past the cuticle and shaft. When I've shampooed my hair, I'll smooth this over my hair mostly from the mid-length to ends in sections and pin it up and put a shower cap on and do whatever I'm doing. Let me tell you now, this smells DIVINE, whatever this fragrance is, it's heavenly. It's not that musk scent that some hair masques carry, it's actually a sensual hair fragrance, the hair be getting it in! Rinsing it out, the hair is smooth and soft but my hair is mostly like that with any h20 and conditioning treatment as it needs moisture. Could I say it's made a difference? I'm not 100% sure, it might look great on those with smoother hair shafts (straight hair) with curls I couldn't say there is any more additional or new shine, it's not harmed my hair colour but there is less frizz around my crown but other than that? I'd probably have to see how it works with a blow-out more than a natural curly do.